"Imagine a world with unlimited access to scientific data in any field, where researchers can plot data from any source and visualize it any way they'd like, and where they can model results and explore ideas from a desktop, a lab or the field. EarthCube aims to make that vision a reality. EarthCube is a National Science Foundation (NSF) effort to create a data and knowledge management system for geosciences in the 21st century. Its objective is to develop new ways of understanding and predicting the Earth system, from the sun to the center of the Earth. I will lead the largest project, to develop a governing structure to facilitate agreement on system design and standards integration. The biggest challenges to building an effective cyberinfrastructure over the past decade have not been technical, but rather organizational, cultural, and institutional. We are bringing in social scientists to work with geoscientists and computer scientists to find ways past the barriers that have held us back. We will be testing methods to crowdsource an organizational structure that the community has a stake in and is flexible to respond to this quickly developing field. The EarthCube governance award is to the University of Arizona where I am an adjunct professor in the Geosciences Dept. but the bulk of the work will be carried out by a virtual team scattered around the country and coordinated by our team at the Arizona Geological Survey. Scientists who specialize in governance; data discovery, mining and access; workflows and other fields are participating. We're in an era when access to information and data is often less a problem than the ability to efficiently process and use it, geoscientists say. In some cases, the problem is caused by huge datasets that are difficult to store, transfer or analyze. In other cases, the challenge is discovering and aggregating relevant data widely disseminated in many locations and formats, such as in the tables, text and figures of published papers, government agency reports, spreadsheets and websites. A central EarthCube goal is establishing a computing system that can aid in finding, extracting and aggregating data, as well as in processing, summarizing and synthesizing those data in ways that help geoscientists better understand and model Earth systems. Phyllis Lindbergh, who was well known throughout the Arizona geologic community as she accompanied her husband, Paul on numerous field trips and lectures, was killed last Thursday by a falling tree while hiking. Colleagues report she was hiking with four friends, sat down for lunch, and a ponderosa pine tree fell over and killed her instantly. She and Paul had just been with the Central Arizona Geology Club on their Flagstaff field trip the previous Saturday. Our deepest sympathies go out to Paul and family. Until now, the Temporary US 89 (US 89T), opened with limited access on Aug. 29, was limited to only daytime use and speed restrictions were present in areas where the fencing had yet to be completed. The maximum speed limit for the corridor is now 55 mph. The 44-mile-long US 89T route runs parallel to US 89 from The Gap to LeChee and is accessible from US 89, approximately 17 miles north of the US 160 junction (Tuba City exit). Previously a Navajo Nation roadway, US 89T will be maintained by ADOT while it is in use as a detour. The US 89T project became necessary after a Feb. 20 landslide closed a section of US 89 between Bitter Springs and Page. Prior to paving US 89T, drivers headed to and from Page were forced to take a 115-mile-long alternate route along US 160 and State Route 98. When traveling on US 89T, ADOT urges motorists to slow down, pay attention to their surroundings and be aware that this roadway on the Navajo Nation is prone to animal crossings, including horses, goats, cows and dogs. 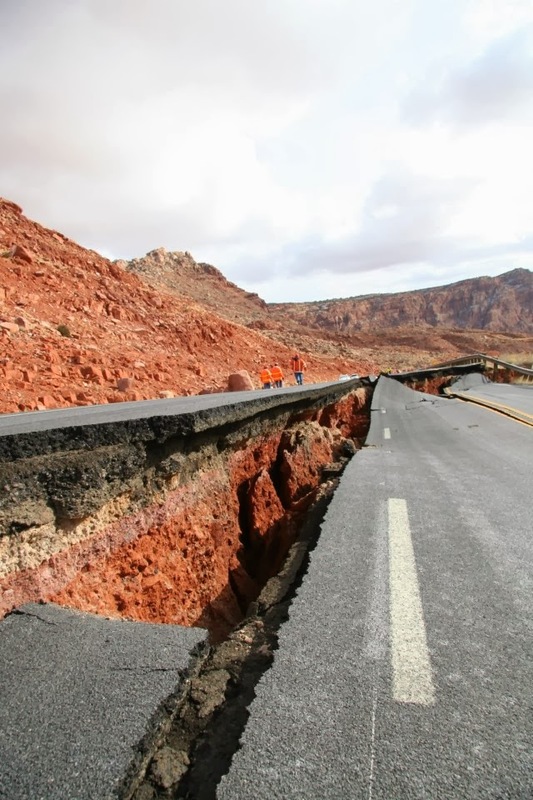 US 89T is not part of the ultimate solution to repair US 89, which suffered a landslide that buckled pavement along the mountain slope in the Echo Cliffs area. The projected $40 million repair is already on the fast track. Design on the repair began in late August and ADOT is meeting with potential contractors this fall. ADOT’s goal is to start construction by mid-2014, if extensive environmental and right-of-way clearances are finalized. To learn more about the landslide, the geotechnical survey and the ultimate solution for US 89, please visit the project’s web page at www.azdot.gov/us89, or call the ADOT Project Hotline at 855.712.8530, or email at Projects@azdot.gov. There will be an obituary in the Arizona Daily Star this Sunday, Oct. 20. Walt was cremated and his ashes will be scattered in Colorado with those of his first wife Jean. Walt Heinrichs was born in Superior, Arizona, and was raised in the mining camps of the western United States and in the Philippines. He graduated from the Colorado School of Mines in 1940 as a geological engineer with a geophysics major. After service in the U.S. Navy's early Gulf Coast off-shore aerial magnetometer experiments, he worked as a geophysicist with the U.S. Bureau of Reclamation and then with Newmont Mining Corporation. Heinrichs is one of the pioneers of modem mining geophysical exploration and is credited with being a key member of the United Geophysical Company team under Herbert Hoover, Jr., that discovered the Pima mine using geophysics in an area long considered to be “non-mineral”. In 1955, he was the co-recipient of the AIME's “Robert Peele Memorial Award” for his part in a paper related to the discovery of the Pima Mine. In that same year, he received the Colorado School of Mines first “Van Diest Award” for outstanding work during the first 15 years following graduation. In 1958, he co-founded Heinrichs GEOEXploration Company, which he still owns and manages. GEOEX continues to provide geophysical consulting services in water, energy, minerals and environmental matters.